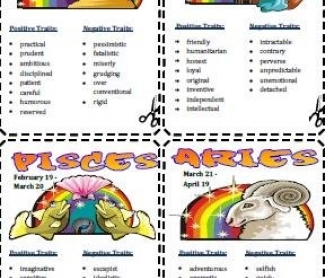 Discussion cards on Zodiac Signs vocabulary and personality adjectives. The aim of the activity is to learn adjectives describing personality, and mainly motivate students to get involved in discussion. 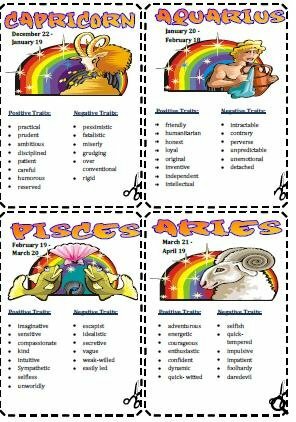 Students look at the cards, read the description of their zodiac sign and compare the positive and negative traits given with their personality. -	When is your birthday? -	What is your zodiac sign? -	What are your positive/ negative traits, according to the zodiac sign? -	Is that your personality? -	Do you have something in common with your partner?